The MT 200 is an all brass pencil tip torch. This torch delivers a fine, concentrated flame for pinpoint heating. The adjustable flame knob allows for flame control and fuel economy. This torch comes in a kit that includes a 14.1 oz. 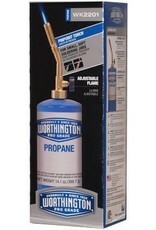 disposable propane fuel cylinder.